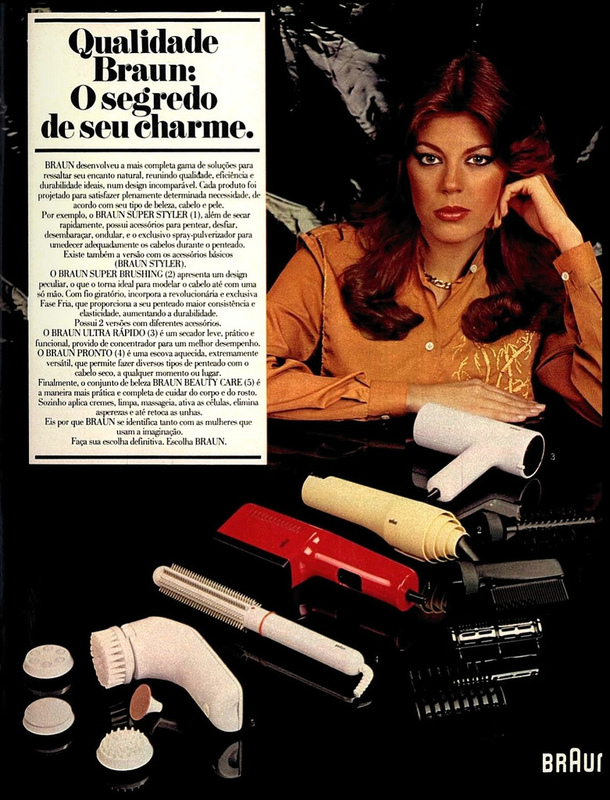 As much as I wouldn't give up my ionic hair dryer and flat iron for the small-barreled curling iron I owned in the '80s, I must admit I have some longing for nostalgia when looking at advertisements and images of hair drying and styling products from before I was born. The other day I was honestly longing for my mother's old bonnet hair dryer that I remember using as a pre-teen...you'd roll your damp hair up in curlers, put the bonnet on, and after 20 minutes or so of blowing warm air later, voila! Your hair is ready. 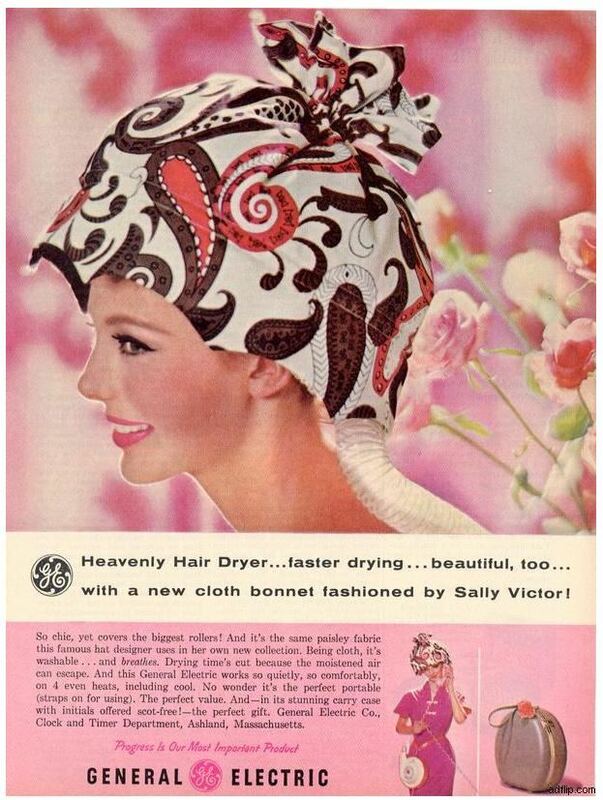 I really admire the selection of colors and styles that were available for drying one's crowning glory. Let's take a look back at some vintage hair dryer and accessories ads from days of old. 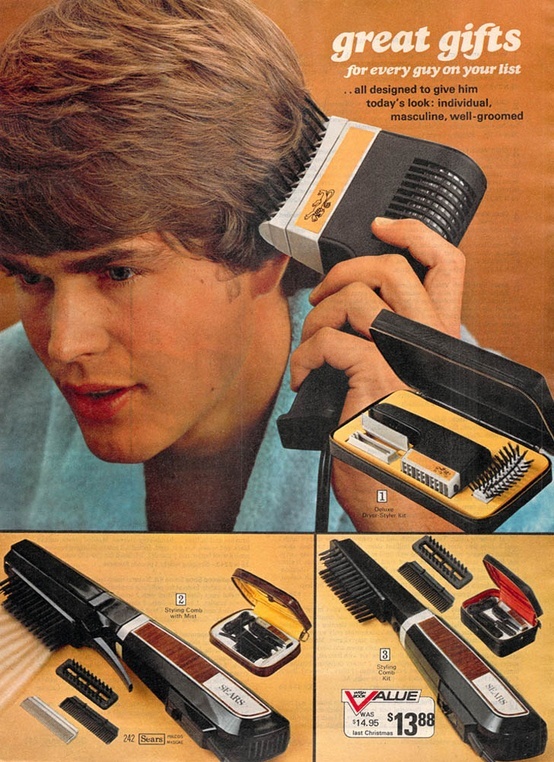 Back in the day, it wasn't just the ladies that put all of that effort into making their hair look good. 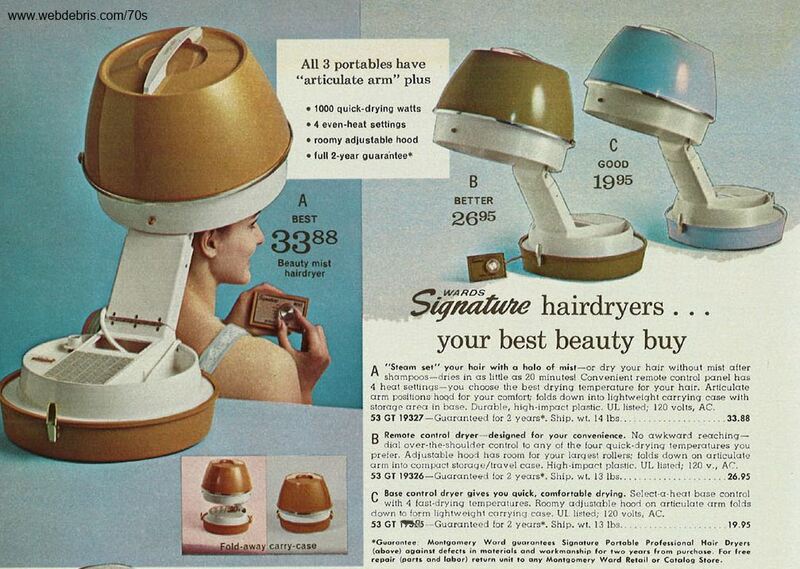 Words will never convey how much I want THIS Beautybug dryer. I believe it came out in '67 or '68 and if you're lucky, you can score one on eBay. 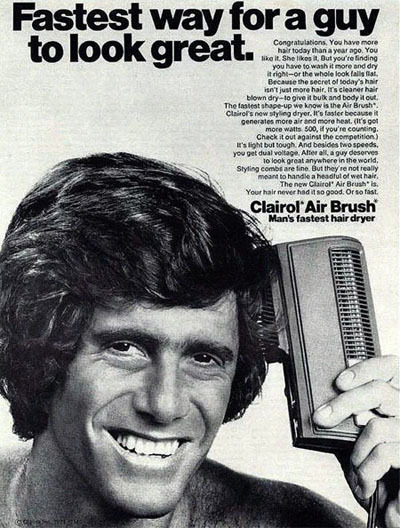 Maintaining that Anchorman look is a lot of work. This German dryer looks pretty cool. 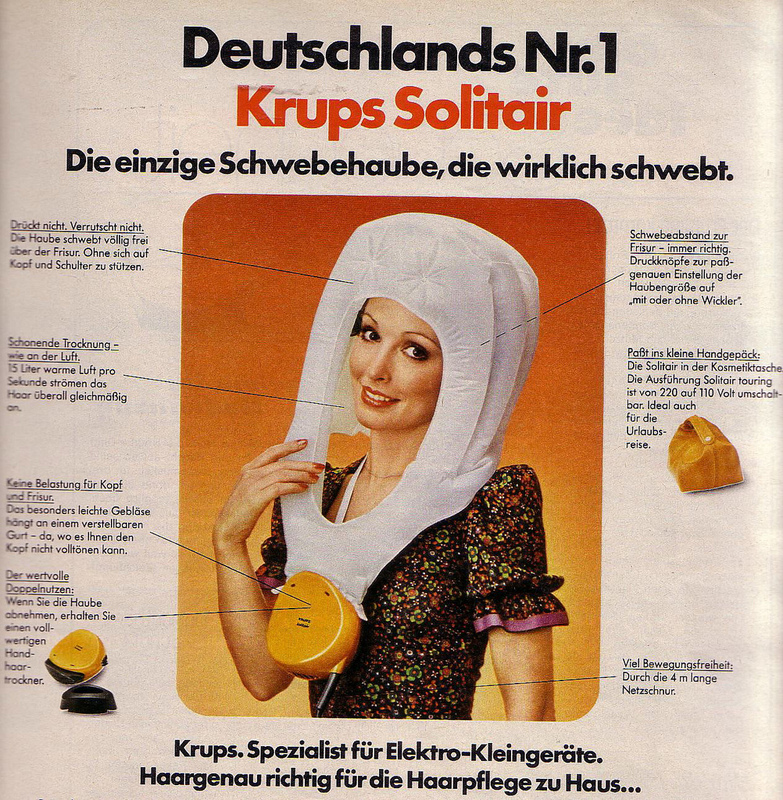 And this ad's just plain bizarre; have seen it crop up from time to time and it's just creepy. 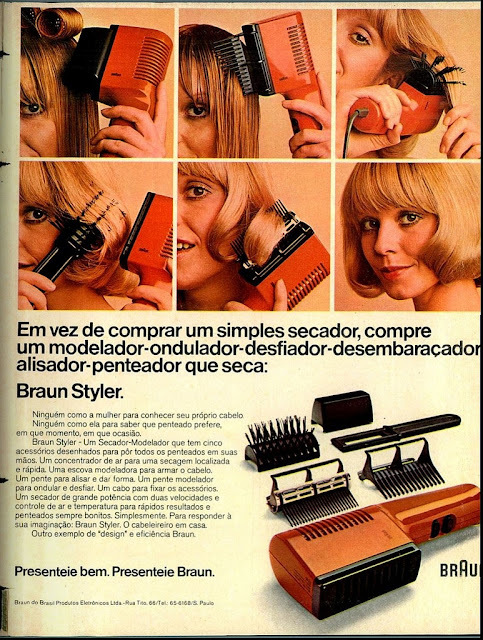 I had one of these...in the hot pink, I think...and I remember I hated it because it blasted the air out of such a tiny, concentrated nozzle which made styling your hair difficult. 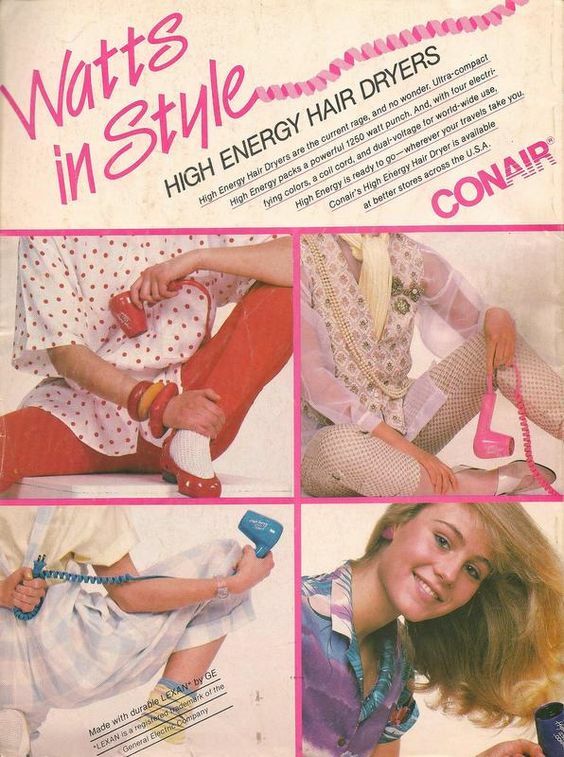 But it was the '80s, and it looked cool. Rad! 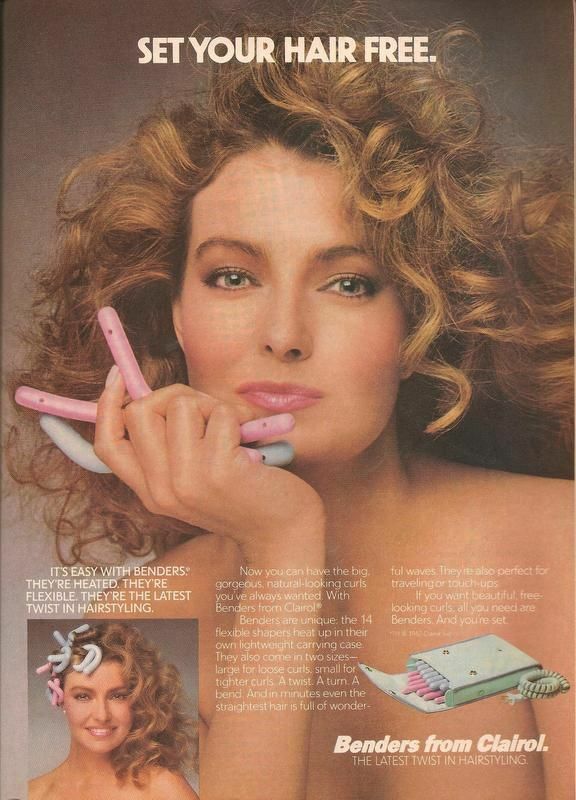 I still have my '80s Benders and last time I checked, they still worked. Maybe I should do a video blog post tutorial trying them out again just for kicks? 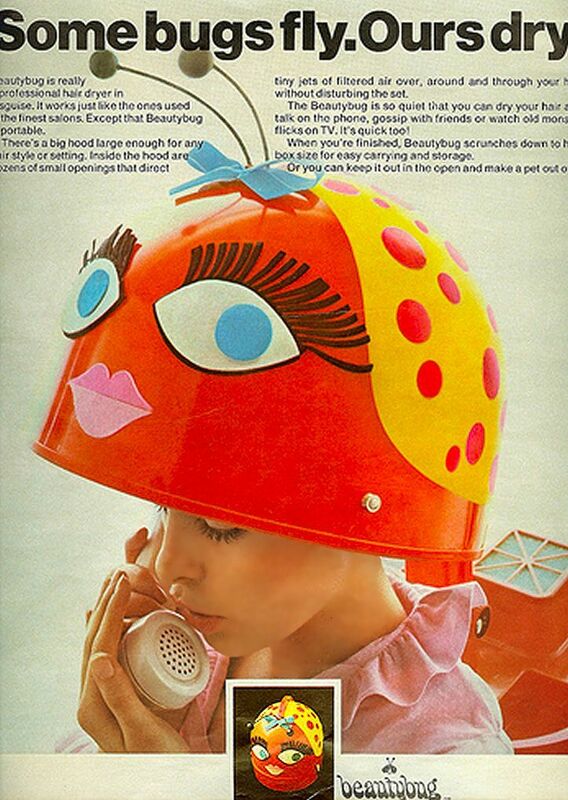 What I admire most about this ad is the beautiful illustration. 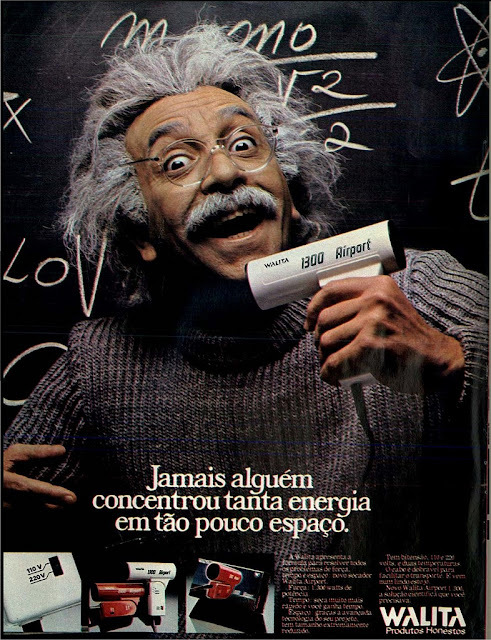 You just don't see artwork like this much today ion advertising and done without a computer, no less. And this is just plain scary. 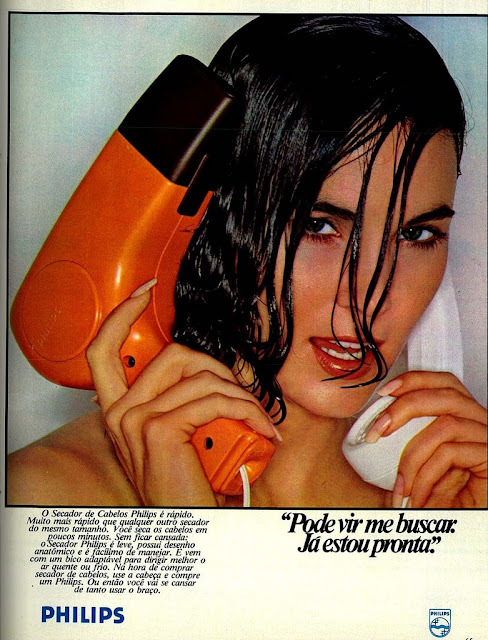 She looks like she's having a truly orgasmic experience drying her hair. Now we know how she got that famous Farrah flip -- and it looks like an awful lot of work. 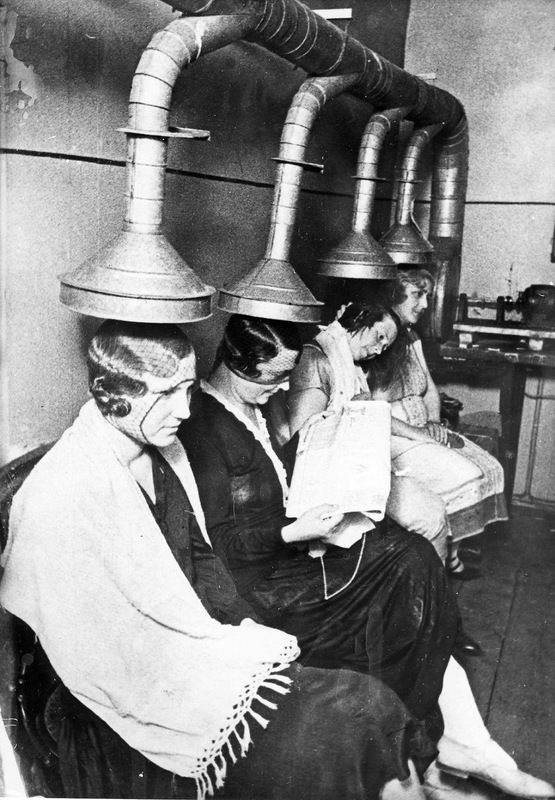 I'm intrigued by the paddle shaped dryer. You gotta love this commercial. 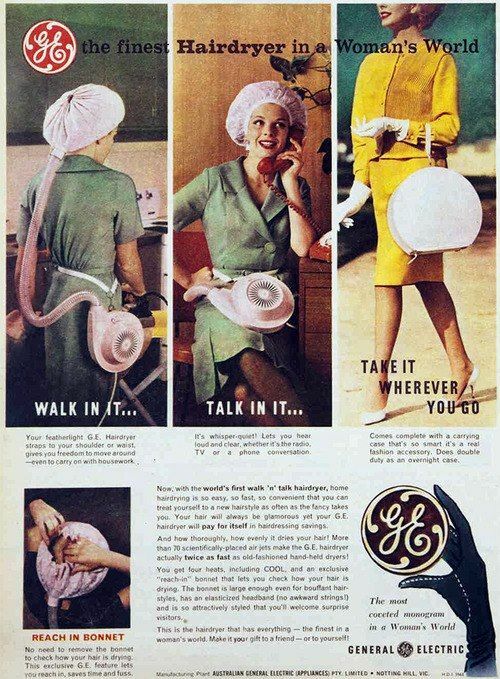 Just imagine how convenient it was for housewives to multi-task...cook and clean your home while your hair dries! OK, that last one wasn't an ad, obviously, but a scary collection of really bad men's hairstyles from the '70s. 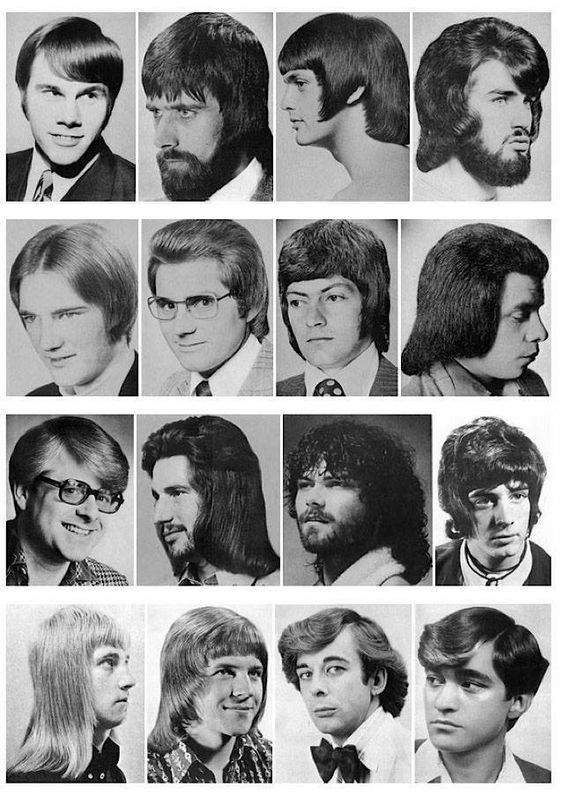 And nearly all of these dudes look like serial killers. Maybe it's a good thing we're living in 2016. A little dab'll do ya! 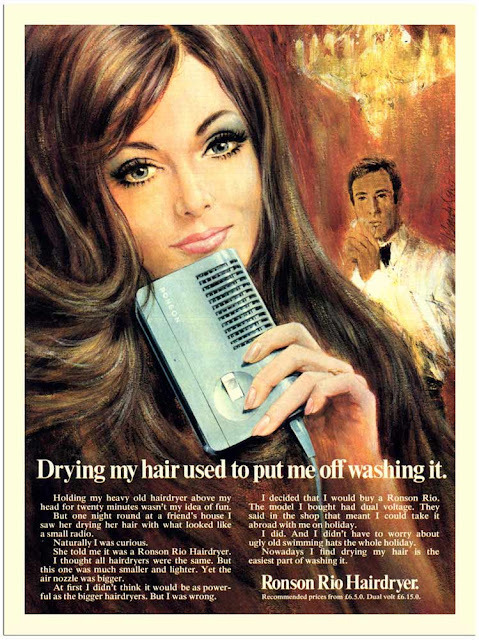 Sometimes I think women are still spending way too much time on their hair compared to back in the day thanks to the crazy colors (and/or constantly changing your color) and straightening treatments that didn't exist a few decades ago. 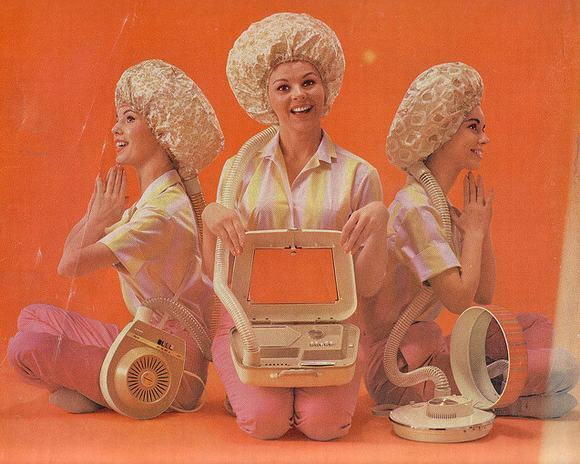 @Pam- TV Classics 'R' Us here, I still read your blog and love the items/topics you post about. 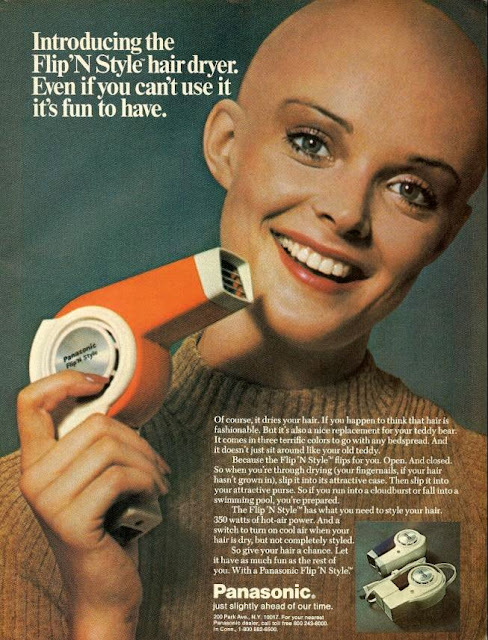 Yeah, the bald headed lady is a creepy ad, funny though at the same time. 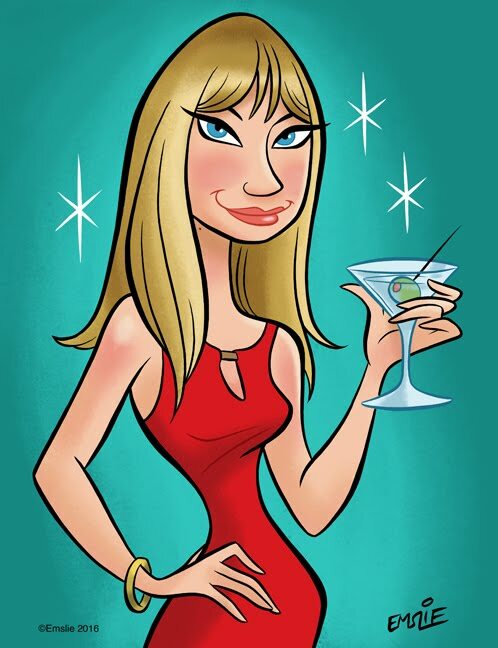 Pam, killer post!! 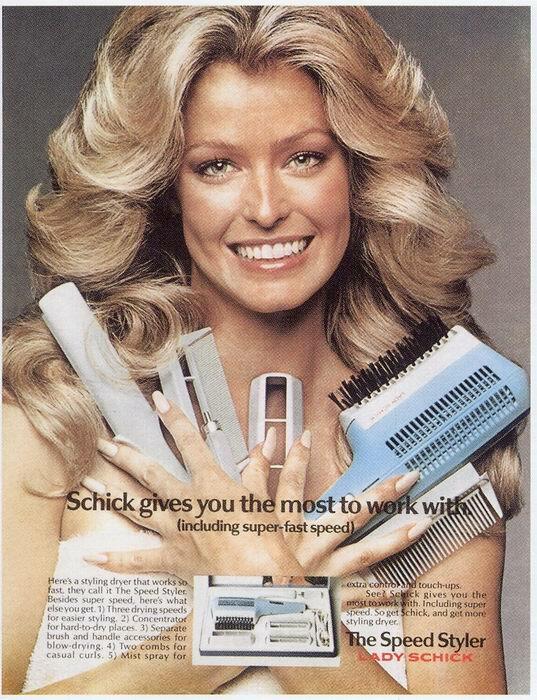 I sill remember my mom going to the hairdresser on Fridays and all the ladies under those massive machines. Even as a lad I thought "This is crazy man" My mom is 83 and still goes every Friday morning!!! 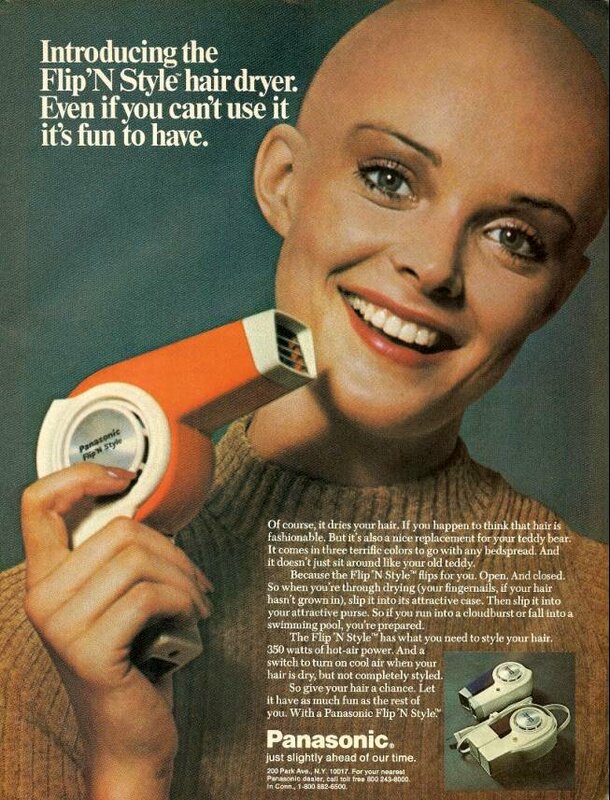 As for me, I wish I had enough hair for it to matter!! 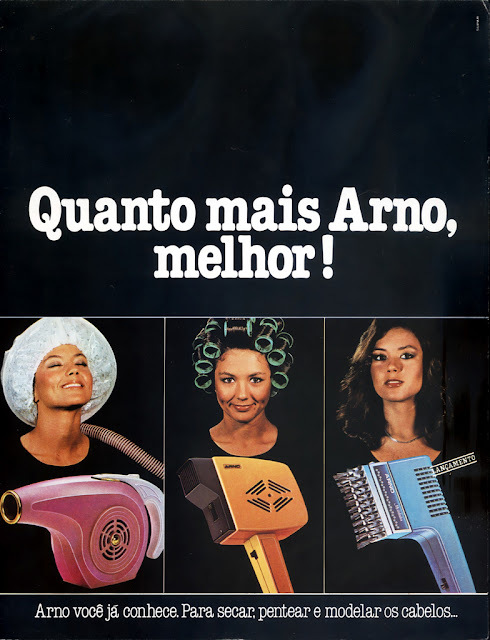 I found this blog via an article in Atlantic magazine about hairdryers. 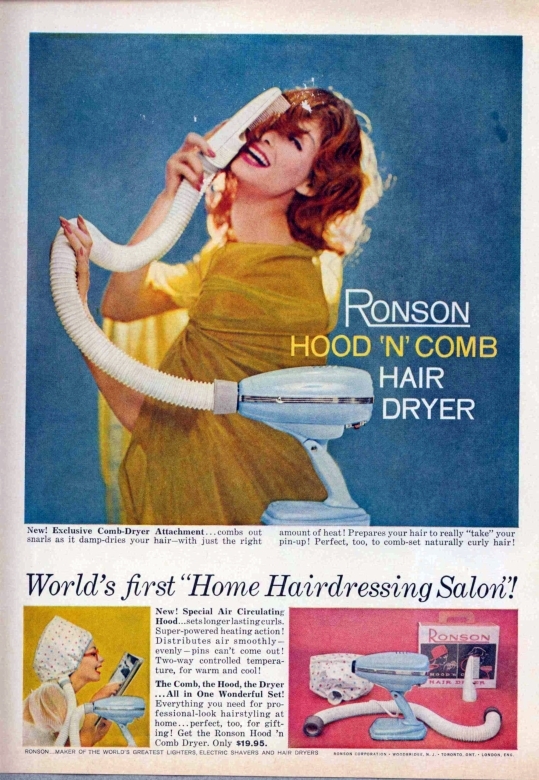 Got me thinking of my own hairdryer history: Mom's bonnet hairdryer, blue vinyl cap with a tube attached. 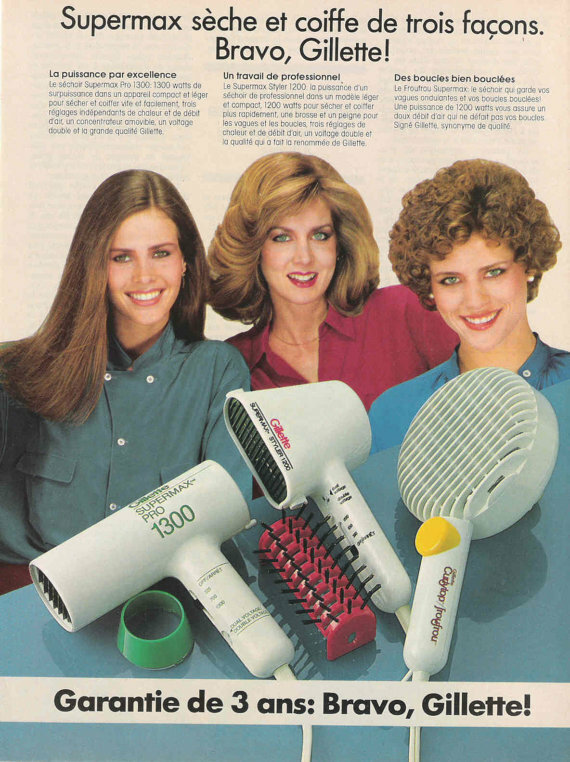 My sisters and I would take off the tube to blow dry our hair in the 70's. Mom died Oct. 5, 2016, the day this article was published. Thanks for this very specific memory of my mother.